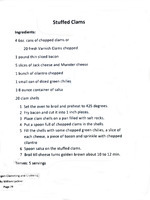 Our Clam Recipe Takes Grand Champion Ribbon at County Fairground dad writes, "My daughter used your recipe for stuffed clams at the Clackamas County Fair and won Grand Champion in her division. She will be cooking the recipe again at the state fair on August 25th." It was just thrilling to experience Emily's success. Her family and friends must be as proud of her accomplishment as I am.